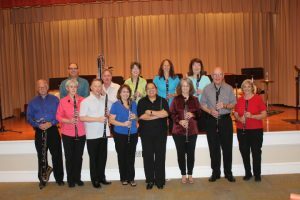 Tallahassee Breezes, the Tallahassee Clarinet Choir, had its debut concert Monday, August 28, 2017 at Westminster Oaks. It was an evening filled with music and educational tidbits ranging from music, composers, and the various clarinets. We had a great crowd and the choir (and our guest percussionist) played wonderfully. I’m very proud of all the work these clarinetists put into this program. They learned a lot of notes, played expressively, and were open minded to suggestions and instructions. I look forward to our next performance together!